Analysis – what does this mean? Why are the figures flawed. A vote in Prince Rupert is as valid as one from Princeton – yes ? No – IMHO ( always been this way ) – define the area of the NP – draw a circle around the area. Have a vote. I will stand with it. The pro and the anti forces had an opportunity to get signatories and the NO vote lost. BUT I don’t like the rules (set by whom) and a lot other people don’t either. The Okanagan-Similkameen is a national “hot-spot” for critically endangered wildlife and need greater protection. We, the undersigned, residents of the province of British Columbia, call upon the Government of Canada to expedite the creation of the South-Okanagan Similkameen National Park Reserve. Sportsman’s Bowl Rd covered in water – Park Rill running fast. Above at Willowbrook Subdivision – stabilized situation – water ponds and pooling reduced noticeably. Kearns Creek running well – less impact. What is health and wellness? Wellness is more about one’s attitude towards life. It is a positive approach to living; a mental attitude of goals towards a healthier lifestyle. Health as defined by the World Health Organization as “Health is a state of complete physical, mental and social well-being and not merely the absence of disease or infirmity.” Health and wellness are different but you can’t be healthy & happy without both health and wellness. Health and wellness work together. How health & wellness is sought after by each individual varies widely. It’s hard to keep up with what’s a ‘new’ or ‘ancient’ practice. Being in the health & wellness industry, I see a wide range of what I call ‘strange’ practices. As is with the diet spectrum, false claims prey on a person’s desperation & vulnerability. There are many ways in which wellness is promoted these days. I am not naming any specifics. People need to be aware of when they are being taken advantage of. You possibly believe in some of this ‘strange’ stuff & that’s fine if you know what you’re getting into (if you really do). But those who claim that if something feels good it must be good for you… think about that. Here’s an example of feeling good or getting relief for a brief period of time… have you ever felt so itchy you wanted to set yourself on fire? Probably not, but that is an example of an extreme situation. What if the itchy person did set themselves on fire or got someone else to set them on fire for that temporary relief? What might the end result be? Serious burns at least, that will leave permanent scarring and at the most, death. Is temporary relief worth the possible consequences? The consequences might not be revealed immediately either such as the case with setting oneself on fire. The repercussions may not be realized for an extended period of time. There is no silver bullet for what you may be dealing with in your daily life. Maybe you feel better for a short while after a procedure of some kind, but did it cure you? Acute conditions or injuries may be healed with proper care, without going to extreme measures. Health & wellness includes physical, mental & spiritual aspects. There are other factors included such as social, environmental etc. When a diagnostic or therapeutic method seems ‘strange’ or mysterious, we need to pay attention. Can the one promoting such claims explain them thoroughly & satisfactorily about how it works? Is it in agreement with known facts, and do several qualified people view it as reliable? Or is the main appeal to the emotions? Claims may be that it was discovered in remote, distant lands, hidden from modern research. Do such claims prove anything or even seem reasonable? And why are secrets involved? If self-proclaimed healers etc. could really heal, then we wouldn’t have all the issues with health & wellness that we do have. Even these ‘healers’ are sick both physically & emotionally. Why would you trust them to heal you if they can’t heal themselves, their families or friends? And you’re lining their pockets on top of it! So if you’re looking for that quick fix or some mysterious healing (or setting yourself on fire), do yourself a favor by keeping things simple (remember that simple doesn’t necessarily mean easy) & without negative consequences. These ‘strange’ practices may prove more harmful than helpful. Being well & healthy as one can be in most cases includes simple strategies such as getting enough sleep& adequate rest, drinking enough water, exercise/movement/activities regularly throughout the day, proper nutrition & for those with medical conditions, it may include necessary medications among other things such as physical therapy (which can usually be included in exercise/movement). Helping others & spending time with people who are supportive, encouraging, have similar interests & care about you will go a long way towards a persons over all well being. Practice makes Permanent. Move more to feel better. For more info or if you have questions, feel free to email me. Town administration is recommending that Osoyoos council approve an agreement between its fire department and Oliver’s, under which the two groups will share each other’s training facilities. Osoyoos fire chief Ryan McCaskill told ODN that the two departments “have worked together a lot” and it makes sense for them to use the different training options each of them offers. The Oliver firefighters will come to Osoyoos to use the training tower at the new fire hall to practice techniques for fighting fires in multi storey buildings. Specifically, they will work on using an existing “stand pipe” in burning buildings to avoid having to carry charged hoses into the building. Osoyoos firefighters will have access to the “live fire container” located at the Oliver airport. Basically, stuff gets lit on fire and the crews practise extinguishing the mock blaze. Why did there have to be a resurrection? Many people have died horrible, torturous deaths, perhaps as vicious as Jesus endured, but they weren’t resurrected. How big is the sacrifice and how necessary is His death if He comes back after 3 days? There are some good reasons. Victory over sin was on the line. B. Old Testament promises had to be kept. Even though the prediction was an unheard of and humanly impossible feat, God declared it would happen. And it did! The reliability of O.T. Scripture was on the line. C. Jesus’ own predictions had to come true. If Jesus was making promises He could not keep, why would we trust Him with our soul? Jesus’ integrity was on the line. D. His intercessory work was still left to do. 1 Jn. 2:2 “But if anybody does sin, we have an advocate with the Father–Jesus Christ, the Righteous One.” Did you know that Jesus is continually available to intercede for us and every believer on this planet? How could He do this if He was still dead? Our spiritual well-being was on the line. E. Our eternal future is at stake. 1 Cor. 15:17 “And if Christ has not been raised, your faith is futile, you are still in your sins.” If Jesus had failed in His mission there would be no hope for us either. Our hope was on the line. A group of women came to Jesus’ tomb just at sunrise on the first day of the week. They found that He was not there. He had risen. It’s glorious in the Sonshine! RETIREMENT, WHO HAS THE TIME? A couple of weeks ago we had the good fortune to attend “The Four Seasons” tribute group at our wonderful Frank Venables Theatre. A rousing good show of songs that were sixties and seventies favourites and, in recent years, had had a resurgence of popularity with the stage show and film, The Jersey Boys. We had purchased tickets in the very middle of the back row and had a perfect view. However, we were there early and watched as the theatre slowly filled to capacity. From my perch I looked down on the rest of the audience and realised I was looking at a sea of white hair, I thought it odd that all these old people had turned out on a snowy night, to watch pop music. It then struck me like a thunderbolt, I was one of them! These old people were my peers! I have no illusions about my youth and beauty, I am nearly 73 and that is fine but, I honestly didn’t realise that the rest of the world thought of me as an old fart. All the grey heads in front of me probably didn’t feel old either, and this was proved, once the show started, by the response from the crowd to the music. We were all singing along, clapping, snapping fingers and at the end all standing to give a rousing ovation to a very enjoyable group of entertainers who had indeed taken us back to our younger years. Thinking about it, I realised that most of the volunteers in our town are seniors. So many very active groups are mainly seniors. We have lots of time to give to our various volunteer groups and we are the mainstay of many organisations, in fact, we are very much involved in every part of the activities in and around town. The workers at the hospital thrift store raises thousands of dollars each year that is given to various medical needs. The Kiwanis do so much to raise money for scholarships and any community project that needs help, the Elks, Lions and other service groups that are always around to lend a hand where it is needed. These groups are for all ages but it is mainly seniors who make up the membership. Those who do not belong to service groups are usually around to help out at any community event where help is needed. Probably many events would not happen if volunteers were not around to help, events like the Half Corked Marathon, various bike races, parade days, library sale day, Scareview and concerts in the park. These are the activities that make all the difference to village life, they are the heart of the community. We are needed and we are important. We may smell of back rub on winter days and we may walk with a limp, even walk with a cane or a walker but we are still a big part of this community. My date book has to be consulted before I can arrange anything as it has so many entries in it, much more than when I went out to work. Seniors unite, we are a strong group and without us, the town would not be as well looked after. Brush your white hair, pull on your support stockings or your knee brace and get out there, you and I are very much needed. The shape of a band is somewhat flat and of narrow width and it is continuous, as in a circle, though it could be another shape. A wedding band has particular meaning as it signifies a promise made between two people. A school band is an orchestra of students playing together. Sometimes, if we are lucky, the band marches while it plays. The band leader wears a really tall hat and has a baton as tall as their shoulder. A newsstand is a kiosk that sells news papers and magazines. That does not mean that a bandstand is a place that sells bands or band accessories. There used to be a show on TV called American Bandstand which was simply half an hour of popular music that teens could dance to. I didn’t get much from it. Maybe if I had danced? The bandstand part was referring to the live band that provided the music. A band saw moves a long narrow band of steel with saw teeth on one edge of that band, that is pulled continuously in a taught upright loop. If you pushed a piece of wood against the teeth the wood was sawn. Pretty ingenious. Also pretty dangerous to be around unless you were very careful. Because the band is quite narrow it is fairly easy to rotate the wood being sawn in order to cut shapes instead of just straight cuts. To band together means more than just meeting. It means infusing a kind of solidarity, togetherness that includes loyalty to each other. Thus, the phrase ‘band of brothers’, suggesting that they are bounds as if brothers. We also have a banded bundle of lumber. A flat narrow metal band is pulled around the lumber and fastened to hold the bundle together. I suppose that a zip tie is a type of band. I’ve heard a railroad track referred to as a band of steel. Ribbon, pretty, flimsy, shiny comes to us in a band. A band aid is not something to help a musical or any other kind of band, but rather a short band of pliable material with sticky on one side and a sterile gauze pad in the middle which we place and stick over a small wound. Some refer to a band aid fix meaning temporary and less that what is really needed. Osoyoos council will likely say “Thank you very much” at its meeting on Tuesday as it agrees to accept $397,000 from the provincial government as the town’s share of this year’s Resort Municipalities Initiative (RMI) funding. Osoyoos is one of 14 cities, towns and villages who get a piece of the $10.5-million pie designed to support programs and projects that enhance the visitor experience. The program began in 2006 under the Liberal government and has been extended at least for this year by the new NDP administration. Regular ODN readers will recall the mild panic that swept Osoyoos town hall late last month when Mayor Sue McKortoff got the mistaken impression from tourism minister Lisa Beare that the program was being left out of the provincial budget, resulting in a nearly $400,000 hole in the town’s finances. It turned out the minister was merely calling to alert the mayor that the program would not appear as a line item in the budget, but would continue to be funded out of contingency monies. The jurisdictions who receive RMI funding are dependent to a considerable degree on tourism to provide their economic activity. Whistler – which actually calls itself the Resort Municipality of Whistler – gobbles up the lion’s share of the program, claiming $6.7 million in 2017. Has this not been done before – recently ?? A Local State of Emergency remains in effect for the Willowbrook area north west of Oliver, BC due to flooding along Kearns Creek affecting approximately 20 homes. The Regional District of Okanagan-Similkameen (RDOS) has hired a specialized hydrologist to look at options for moving water through the area. The RDOS has also received funding from Emergency Management BC to do a 2018 specific flood risk assessment based on the heavy rain received and high snow pack in the southern Interior. The Willowbrook area is located upstream of a number of other homes along Kearns Creek. Looking at the effects of water upstream and downstream of the community will be considered before digging or pumping will be enacted. The water in Willowbrook remain stable but a concern is slowly rising ground water. Rising ground water is a concern for the entire RDOS as snows melt. Residents should check basements for water and prepare their property for any potential run off. Sand and sandbags are available across the south Okanagan for homeowners. See below for sand and sandbag locations. With the Kearns creek flow slowing, for now, I would personally like to thank all of the volunteers who came from not only Willow brook but the whole area. It restored my faith in humanity. We hear so much negative about the youth today but that was not the case here. There were a number of young people, teens, and preteens who worked diligently filling sandbags. I noticed one young girl (no that’s wrong I have to call her a young lady) consistently loading sandbags onto trailers, these sandbags must have been close to half her weight.These young people earned my full respect and deserve to be commended. While Director Terry Schafer allowed me to become the media face it must be pointed out that he worked selflessly behind the curtain at hounding the various Govt. departments and reminding them of their culpability in both causing and then ignoring the problem. We know the solution and that has now been turned over to the RDOS to implement. That now leaves Director Schafer with another bureaucracy to motivate, he will need our help. I say this was selfless in that every repair to the flow of Kearns Creek sends that water downstream to Director Schafer’s neighborhood where he is also flooding. Every pump that can be commissioned should be put into service pumping over into the river from Island road to Road 22. Our help will also be needed there. Were this a forest fire untold resources would be thrown at it by the province.This is no less an emergency so it falls to us the people to see to it that all govt. departments step up to the plate and start doing their part. They can have their meetings afterward. A Local State of Emergency remains in effect for the Willowbrook area north west of Oliver, BC. Since yesterday, water moving through the Willowbrook area in Kearns Creek has stabilized. Volunteers continue to do amazing work protecting homes, structures and property in the area. The upstream Kearns Creek Dam has been lowered significantly overnight. Lowering the dam level has significantly reduced concerns in the area. The Regional District of Okanagan-Similkameen under the direction of the Interior Health Authority, will commence temporary chlorination of the Willowbrook water system. The Boil Water Notice, currently in place, will remain in effect until further notice. The groundwater level has risen over the past couple of days due to surface water flooding. This rise in the aquifer level may increase the risk of contamination of the groundwater from surface water. Rising ground water is a concern for the entire RDOS. Residents should check basements for water and prepare their property for any potential run off. Sand and sandbags are available across the south Okanagan for homeowners. See below for sand and sandbag locations. Easter always brought the Gill family to visit with Jen’s Mom and Dad, Mr. and Mrs. Kelly. Ray and Jennie with their boys Gordon, Wayne and Gary from Vancouver and Ray’s Mom and Dad Mr.and Mrs. Gill from Castlegar would all arrive about the same time on Thursday night. Sometimes Ken Kelly and his wife and girls would come depending on where Ken was stationed. He was in the Air Force and moved quite often. On Good Friday after we attended the services at the Church we would come home to find the house full of the Kelly clan planning our Sunday Easter Parade. This was no ordinary parade of fine clothes and elegant hats..no way..no how! The one thing about the Kelly clan was they all loved to dress up and the more outlandish outfit the better! The men would dress in women’s clothes and the women in men’s and the kids in their Mom and Dad’s clothes! Mr. and Mrs. Gill were very proper English but were just full of fun and willing to do anything for a laugh. We enjoyed watching them join in the fun. Sometimes we would be able to talk some of the neighbours into joining our parade but usually it was just the Shaw’s and the Kelly clan with the neighbourhood watching the festivities. On Saturday we coloured all our eggs early in the morning and then Mom and Jenny would peel the potatoes and veggies for supper as we all spent Saturday night together. Grandma Pioli and Grandma Kelly were in charge of making enough pies to feed everyone! Mr. and Mrs. Gill were in charge of decorations; Dad, Ray and Bill Kelly were in charge of refreshments!! Dinner time was chaos with kids everywhere and little tables set up here and there and finally it was time to sit down and have dinner. Mr. Kelly was a hunter and our dinner was always a beautiful venison roast that was saved for this special occasion. The evening was spent putting finishing touches on our costumes for the big parade and then the adults played cards until late into the night while we played board games until we all just collapsed and fell asleep with bodies lying at the end of our beds until it was time for them to go home! Sunday morning, Mom, Grandma, Sandy and I (later Norma too) would be off to Church for the Easter Services and then home to our Dad’s awesome pancakes or waffles. We could barely eat as we wanted to get outside and find all our Easter goodies. We would meet the Gill boys in the back alley collecting their goodies. There was a time honoured tradition that the middle of the road was the line we did not cross so we couldn’t collect the wrong goodies!!! Our parade was usually right after lunch and everyone would line up in the back alley dressed in their bizarre outfits. Mr. Gill made the cutest little old lady you ever saw! The rest of the adults were pretty darned funny and we had a hard time not laughing too loudly at my Dad who always had one of Mom’s pretty dresses on and his hair was curled (thank you to Sandy) and he and Ray even had lipstick on! The men all wore very fancy women’s hats that the wives had made the night before!!! Gordon was kind of the Pied Piper and led the parade playing his recorder and everyone would sing and do little dances as we went down the back alley and out onto the road..down past the Makaseff’s and around the bend and up the street all the way up to Earle Crescent..then along Earle Crescent to our street and down the hill to our house. Sometimes the neighbours would follow along so they could see the whole parade. Gordon learned to play “Easter Parade” and a few other Irish tunes that we all knew the words to. There was much laughter and fun back and forth…and it ended up with the parade coming to a halt in front of our house. This was the highlight as Dad and Ray would do the Irish jig or step dance and poor Gordon could barely keep up! Oh my when I remember the good times my sides hurt from laughing! I remember once many years after the Kelly’s passed away and Ray and Jen were not well enough to come to Oliver, Mom and Dad got dressed up and Norma took a movie of them doing their own parade. We mailed the movie to Ray and Jen who phoned as soon as they got it…lots of laughter and tears that day! So my friends, I hope you enjoyed this little memory and May the Good Lord bless and keep you now and forever! The Town of Oliver submitted a joint application with the Town of Osoyoos for the Emergency Social Services funding. The grant application was successful at the full amount of $25,000. The intent of this funding stream is to support eligible applicants to build local capacity to provide emergency social services through training, volunteer recruitment and retention, and the purchase of equipment. Also the Town of Oliver submitted an Emergency Operations Centres & Training grant and was successful at full funding of $25,000. The intent of this funding stream is to support the purchase of equipment and supplies required to maintain or improve Emergency Operations Centres (EOC) and to enhance EOC capacity through training and exercises. The Town intends to purchase equipment to establish an independent EOC at the Oliver Fire Hall. Both grants are to build capacity and was not already identified for in the current budget. Last day of concrete work – repairing the floor bottom on the canal between Road 3 and 2. Silver Springs Concrete Services is the contractor the Town hired to help with the work and Town employees prepped the floor of the ditch. H&M Excavating assisting the Town on a mainline irrigation repair on Road 2 at Primrose lane. This is a major T – intersection in the irrigation system which involves the intersection of a 24”, 18” and 10” pipe. A ‘speciality tee’ had to be made/ shipped to us for this project to get a properly sized fitting. This project was supposed to be completed a week and half ago but the part took longer than anticipated to arrive. Work will be complete this morning. Declaration of a Local State of Emergency for the community of Willowbrook in Electoral Area C.
Due to the threat of flooding and possible damage to properties in the vicinity of Kearns Creek near Willowbrook in Electoral Area C, Regional District Chair, Karla Kozakevich has declared a Local State of Emergency. When safe access or egress to residents is threatened, the RDOS can request a Local State of Emergency be imposed to provide additional resources in the event that an evacuation of residents or emergency works in the community becomes necessary. There has already been active sandbagging and precautionary preparedness by the community. Provincial agencies are on the ground assessing culverts and local dam infrastructure and working with the RDOS on this localized emergency response event. The Emergency Operations Centre is continuing to remain open. The RDOS and Willowbrook residents along Kearns Creek were advised late yesterday that the flow in Kearns Creek, which meanders through the community, would begin to rise slowly overnight and persist over the next couple of days. This was due to a ‘draw down’ order from the Province on the Kearns Creek dam near Willowbrook. Up to a 6 inch rise was cautiously predicted. The RDOS had previously delivered 2000 sandbags and several loads of sand, but added to that after hours last evening with an additional 24 yards of sand and 4,000 more sandbags. Last night, the community rallied together with 50 volunteers, alongside Willowbrook Fire Services to fill and deploy sandbags. This community effort was greatly assisted through mutual aid agreements sending personnel from nearby Keremeos and Oliver Fire Services. On-site Incident Command to coordinate these efforts was provided by Willowbrook Fire Services. The RDOS Water Operations staff also worked late into the evening armouring the water system pump house and wellhead. The RDOS Emergency Operations is in contact with the dam owner, Provincial agencies and those undertaking the draw down. The Emergency Operations Centre will keep residents informed of any additional situations as they arise. The RDOS wishes to acknowledge the quick and helpful residents in the community and the Fire Departments for stepping up during this unexpected event. Rushing creek ( Kearne’s ) passes within feet of front door of home. Last night dozens and dozens of people helped the community to make, distribute, and pack hundred and hundreds of sandbags late into the night. The situation has stabilized a bit but much work to be done to ensure the creek can flow properly through culverts – heading to the river down stream. Some roads closed (sandbags) some flooded but passable. Huge ponds created by “way too much” water – and spring run-off no where near its peak. There are two main concerns – upstream water being released from dams by owners and the blockages near Meyer’s Flat (park) that is a real obstacle. Council voted unanimously last night to support a new funding formula for additional transit services that will see bus service Osoyoos to Kelowna and return. Presently the Town of Oliver budgets for $11 697 for a service that goes to Penticton week days. The proposed service for 2019 would take the buses right through to Kelowna – Monday to Friday at an additional cost of $7419. According to CFO Devon Wannop – the cost new cost per household will be $5.72 up from $3.39. This is not a bus fare but a municipal subsidy. The city of Penticton has also endorsed the new concept and other rural areas and municipalities in the RDOS are being asked for their go ahead. which would help with the overall budget. 23rd annual SOSS Enrichment Fund Society – golf tournament – will be held April 7 and 8th in Oliver. The tournament is a major fund raising for scholarships (over 21 thousand dollars to be given to 27 students) this year. Gail Erickson owns this rendition of early Oliver Main Street painted by Osoyoos artist Michael Jordan. Councillor Maureen Doerr presented it to Mayor Hovanes tonight at a council meeting on behalf of Mrs. Erickson. The bowl is the lowest elevations next to Kearne’s Creek which because of early runoff is starting to flood roads and homes. More sand is needed and expected soon. The Town of Osoyoos has issued a BOIL WATER NOTICE for Domestic Water Customers served by Rural Water Systems 8 & 9 Effective April 1, 2018 until November 16, 2018. Please refer to the first three digits (008 or 009) of the account number on your annual utilities invoice, or click System 8 or System 9. During this time period the water source is switched from groundwater (wells) to surface water supplied from Lake Osoyoos. While the Osoyoos Lake water is chlorinated, the current disinfection process is not adequate to protect from bacterial, viral and protozoan pathogens that may be present in the surface water source. The Town of Osoyoos and Interior Health recommend individuals drink boiled water or a safe alternative until further notice. Rural Water Systems 8 & 9 customers, water intended for drinking, washing ready to eat fruits and vegetables, making beverages, ice, or brushing teeth should be boiled for one minute. Interior Health has been consulted, and the public will be notified when conditions change or water quality has improved. The Town of Osoyoos is in the process of separating irrigation lines from domestic lines to improve water quality. The public will be notified when these projects are completed. Mud and water coming through orchard (Sumac Drive) from Fairview Mtn. area – believed the clean up work at golf course has altered the course of the water from mountain. A lot of sandbagging going on in the subdivision – two roads flooded but passable. One road closed. Government officials on hand Sunday, Argo on site today. Global crews there to do story. The south Okanagan Native tribes knew better than to set any permanent settlements down in the bottomlands surrounding Okanagan River. They just shook their heads at the advancement of European settlers into the wet areas of Penticton’s townsite. Right from the humble beginnings of Penticton, Naramata, and Okanagan Falls; floods were a regular spring event. As colonial imports, we ignored warnings and just weren’t prepared for the annual freshet. The pattern was clear in reports from the press: “Penticton Creek Dam Overflows Spillway” May 25, 1912. “Creek Breaks Bounds – Freshets cause washouts” May 17, 1913. “Creek Breaks Bounds – Property Damaged” May 16, 1914. Then the worst in 1921, “Creeks Rampage; Flood Working Havoc” “Ellis Reservoir is a Total Loss”. Property owners who suffered great losses petitioned the town for compensation to no avail. The Board of Trade insisted something be done to drain the water away from arable lands. There had been catastrophic damage to over 1000 acres. The Board blamed this flood on the fact that dredging of Okanagan River had been suspended for the past three years. The citizenry stepped in and stopped any advancement of capital projects that would raise their taxes. They would rather take their chances with the floods than pay a penny more for controls. This seemed a strange attitude for the day. It was seven years before flood controls were a reality on Okanagan River. In 1928, flood gates were installed at the intake to Okanagan River. This removed any chance of navigation to the river for the perceivable future. As is always the way, the gates had no effect on the devastating flood of the same year. Outside City Superintendant, T. Finnie, the man in charge of the annual cleanup of flood debris; suggested several improvements to the creek bed. In 1934, he suggested a dredging of the lower creek bed and installation of a cement liner. He suggested the use of relief labour. Mr. Finnie was the originator of the diversion idea. Turn Penticton Creek and have it drain in Ellis creek. This idea fell on deaf ears and Superintendant Finnie was told to continue hand work on the creek bed. In 1935 during July 1st celebrations, a storm drenched the town and the creek could not drain the water away. By morning the entire town from Westminster Avenue north was a lake. That was enough for the council. They searched and found an engineer who had worked many years for the City of Los Angeles. Mr. A.R. MacCleave was an Engineering graduate of Dalhousie University and an experienced civil engineer. He was appointed to solve the problem. After considerable study, Mr. MacCleave proposed a diversion of Penticton Creek into the Ellis Creek Channel. A channel would be prepared from the rock dam above Forestbrook Drive and join Ellis Creek 200 yards east of Main Street (around Penticton Avenue toward the hospital at Carmi School today). The channel bottom would be only seven feet wide as the slope would provide rapid disposal of water. Superintendant MacCleave continued his mapping and geological study of the area and in 1937, it appeared his plan was to be launched. Council put together a cost effective budget, taking advantage of Federal work programs to provide labour. That’s when a strange series of events came to pass. A citizens group led by Major Hugh Fraser came forward to oppose the diversion plan. It was stated that in the midst of the depression, the taxpayers of Penticton could not absorb the cost of the project. Pressure on Reeve Wilkins and council was too powerful. Even though the Province had given approval in principal for funding and federal financial assistance was a matter of course; the plan was dumped. In August, Engineer MacCleave was terminated. In May, 1942, God moved the creek and wiped out the town core. From Spain to Mexico and back to Canada, Flamenco Rosario invites audiences on a global voyage through dance. This April on the Frank Venables Theatre Stage the rhythm and song, hand-clapping and sweeping movements of “La Monarca” will be a unique experience. Flamenco’s beautifully rhythmic style highlights these artists’ passion, raw emotional power and disciplined musicality. “La Monarca” gives insight into the motivation and driving forces of immigration through the creative exploration of the monarch butterfly’s amazing migration. Rosario Ancer and her husband, guitarist Victor Kolstee moved to Vancouver in 1989 after a successful career in Spain. They co-founded the Vancouver International Flamenco Festival along with their school Centro Flamenco, and The Flamenco Rosario Arts Society. As an interpreter of flamenco, Rosario is continuing the growth of the art form by exploring new possibilities. She brings with her an 8 member company of dancers and musicians to share this emergent, beautiful and unexpected new work. 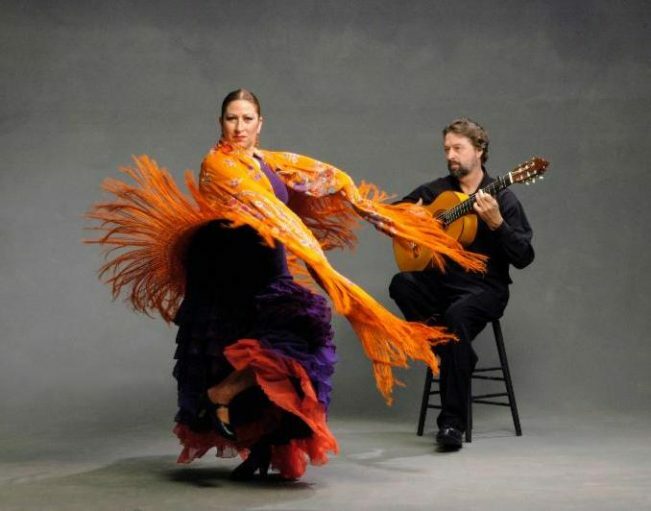 Flamenco Rosario arrives on stage with “La Monarca” Monday April 9th at 7:30 p.m. at the Frank Venables Theatre, 6100 Gala St, (corner of Fairview Rd.) Oliver is a dance town and these highly sought after tickets are now available. Visit www.venablestheatre.ca or the Theatre Box Office Tuesday to Thursday from 10 – 3 for tickets and more information. As a resident of Willowbrook Valley for over 30 years, I’ve seen many changes but only recently very serious problems. The inaccurate gossip about water shortages have plagued new buyers and affected the value of our homes, yet we have no idea who started that malicious and false rumour. NOW… we are really faced with problems and no one is listening!! Since the transfer of responsibility to the RDOS under the auspices of a water advisory board, we are now faced with an increase of 230% but we are facing a significant decrease in support and service. Much more seriously, the lack of sensible improvements to the water system and drainage infrastructure has led to serious, health threatening flooding and no monitoring of blatant mismanagement by property owners. I watched helplessly last season as one homeowner surreptitiously pumped water into a neighbour’s yard. An overturned hot water heater with the top and bottom cut off is NOT a culvert. A drainage ditch that has been dammed by the property owner to enhance landscaping should NOT be allowed. The unchecked flooding, not managed properly by culverts or drainage has led to major concerns: sewer leaching into drinking water, the potential of no water supply in case of power outage rendering us with no fire protection, an arbitrary boil water advisory in place for over a year, serious damage to homes and very upsetting disruption to the families affected, to name but a few. The stress of being displaced from your home, the costs of repairs that insurance may or may not cover, the extreme difficulties that are desperately frustrating are but a few of the challenges facing families. It is baffling and a waste of money, time and resources that the RDOS wants to conduct another study on what needs to be done rather than use the one that was done prior to them taking over the system. We Willowbrookians are fully aware that if just ONE of the RDOS staffers lived here, we would NOT be in this mess. RDOS, step up! Be different than other bureaucracies and actually DO something for your constituents. We are counting on you, just this once! Among the many things I enjoy about Oliver, the one that stands out the most is how quiet the winter night is. At 10 pm while standing on the street and listening, all I hear is the silence and the stillness of the night. No barking dogs, no noisy motorcycles, no whine of the racetrack, and no truck jake brakes, unlike Osoyoos with its Anarchist Mountain highway winding its way into the Valley, rife with jake braking transport trucks. Many an evening I have appreciated the full benefit of the Oliver quietness while standing on the blacktop and looking at the stars. As a child being raised by fruit growing parents, I don’t remember appreciating the quiet, quite like I do now. In my pre-teen years, I remember waking up in the peacefulness of the morning after sleeping outside under the stars. The evening before, we would drag a canvass groundsheet onto the lawn, place a mattress on top of it along with sheets and blankets and we fell asleep watching the shooting stars as well as the odd satellite going over. I wasn’t aware of the evening stillness because our irrigation pump was usually running and it was nearby. As a young teenager I enjoyed sleeping outside but didn’t enjoy hauling the mattress to the sawdust bin so it could dry out from the night dew while resting on the upside down apple boxes. Then having to haul it back to the lawn in the evening to sleep on it again. Finally, I just left the mattress on the over turned apple boxes, put sheets on it and slept on it as it was. I was still outside but protected from the elements and I slept wonderfully well! There didn’t seem to be many mosquitoes then either. I didn’t connect the dots at the time, but there seemed to be fewer Mosquito Hawks too. In July of 2014, I wrote a bit for ODN about sleeping outside one summer night in Oliver during that year and the inconveniences of the night noises. Two years ago, one of my sisters gave me a blow up mattress complete with foot pump, so I could sleep outside in Edmonton. My first night was an experience! You must understand, our residence is .5 km from a major thoroughfare called The Whitemud Freeway.There were loud motorcycles, loud cars, jake braking trucks, emergency sirens blaring intermittently, and mosquitoes! The positive aspect was that the mattress was comfortable and I was warm enough. I bought a mosquito net and ear plugs for the next night and slept like a baby, well… one that sleeps all night. My sleeping outside that summer ended with a down pour. This year, I intend to sleep outside again, now that I’ve got it all figured out. I’ll still be subject to down pours, but I’ll take that risk. When we return to Oliver for a visit during the warmer months, I’ll be looking forward to enjoying the evening silence. Hopefully, it will be as quiet as the winter nights were. Just south and west of the stream going OVER the road – firefighters, friends of a neighbor sandbagging a house at the corner – one of the lowest in the rural area community. The community is rallying to action to help neighbours totally frustrated with government generally. The problem was there last year and limited action taken. The culprit this time is Kearne’s creek which is “really moving” and providing more than enough water to cause problems for residents. Locals took out two large culverts on private problem yesterday to help release the backups but nothing seems to be enough and the pooling and NEW lakes forming are causing problems. Above is high resolution – press with mouse. Thanks to Jim and Susan Stanley for the heads up.